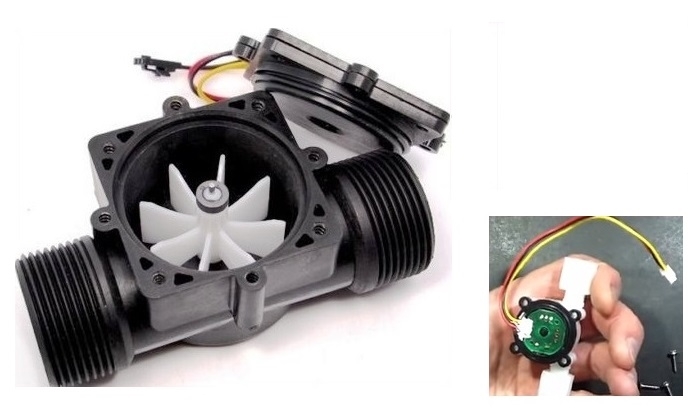 We will learn how to connect Water flow sensor YF-S201 to Arduino board and use it to measure the water flow. 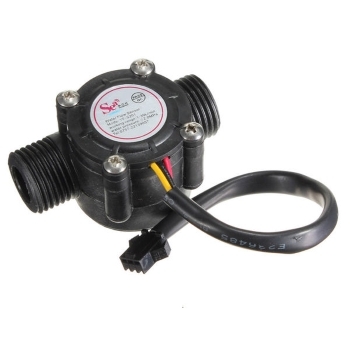 The Flow sensor is a device which is used to measure the water flow.This sensor sits in line with your water line and contains a pinwheel sensor to measure how much liquid has moved through it. There's an integrated magnetic hall effect sensor that outputs an electrical pulse with every revolution. The hall effect sensor is sealed from the water pipe and allows the sensor to stay safe and dry. Flow sensors use acoustic waves and electromagnetic fields to measure the flow through a given area via physical quantities, such as acceleration, frequency, pressure and volume. The sensors are solidly constructed and provide a digital pulse each time an amount of water passes through the pipe. We have as example Arduino sketch that can be used to quickly test the sensor, it will calculate the approximate flow of water in liters/hour. 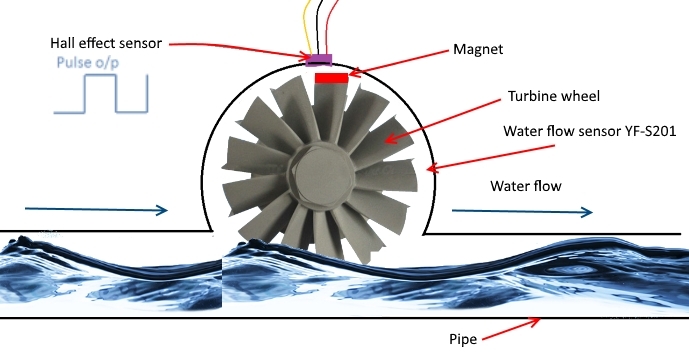 This picture gives detailed working method of hall effect sensor based water flow sensor, a turbine wheel embed with magnet is placed on a closed plastic envelop and a Hall effect sensor placed, When the water flows through the pipeline, it makes the turbine wheel to rotate and hence the magnet flux interferes the hall sensor, the rate of interference is depends on the speed of water flow, so the hall effect sensor produce pulse signal output, this pulse output can be calculated as water volume. 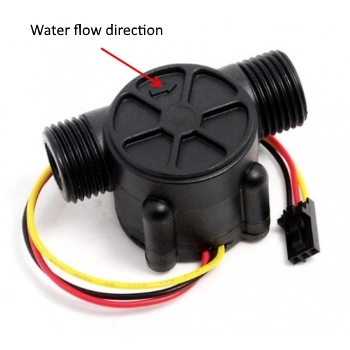 By counting the pulses from the output of the sensor, you can easily calculate water flow. Each pulse is approximately 2.25 milliliters. Note this isn't a precision sensor, and the pulse rate does vary a bit depending on the flow rate, fluid pressure and sensor orientation. It will need careful calibration if better than 10% precision is required. The pulse signal is a simple square wave so its quite easy to log and convert into liters per minute. Flow rate can be determined inferentially by different techniques like change in velocity or kinetic energy. Here we have determined flow rate by change in velocity of water. Velocity depends on the pressure that forces the through pipelines. As the pipe’s cross-sectional area is known and remains constant, the average velocity is an indication of the flow rate. The basis relationship for determining the liquid’s flow rate in such cases is Q=VxA, where Q is flow rate/total flow of water through the pipe, V is average velocity of the flow and A is the cross-sectional area of the pipe (viscosity, density and the friction of the liquid in contact with the pipe also influence the flow rate of water). You can find the sensor datasheet here. There are two algorithms for counting sensor’s pulses. 1. External interrupt. 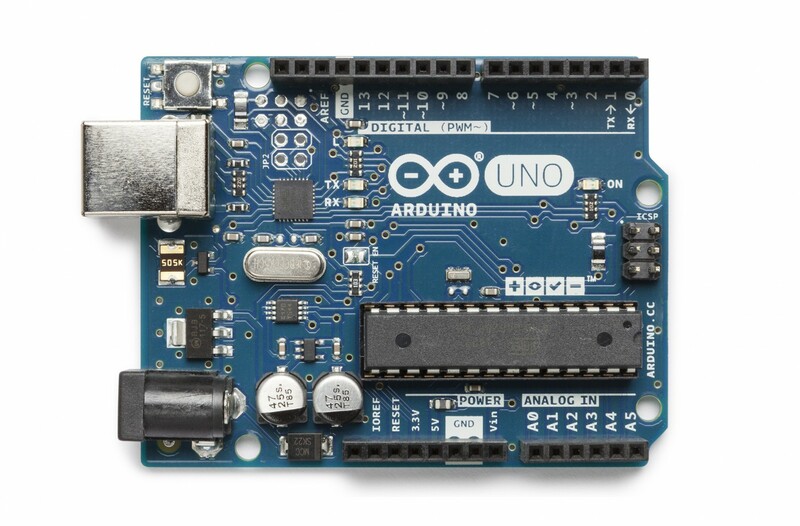 If you count the number of pulses from the sensor using an external interrupt, then the sensor information lead must be connected only to that Arduino digital pin which uses an external interrupt. The advantage of this method is that all sensor’s pulses will be accounted, and for that we don’t need to suspend execution of the sketch. The disadvantage of this method is that not so many Arduino digital pins use external interrupts. 2. Measuring the pulse (pause) duration. If you count the number of pulses from the sensor by measuring the pulse (pause) duration, then the output of the sensor can be connected to any Arduino pins. The advantages of this method: the number of connected sensors is limited by the number of free Arduino pins, the speed calculation done in real time, after each pulse (pause). The disadvantage of this method is that depending on the algorithm chosen, either there is a risk of missing the pulse (pause), or it will be necessary to suspend the execution of the sketch for the duration of the pulse (pause) measurement. 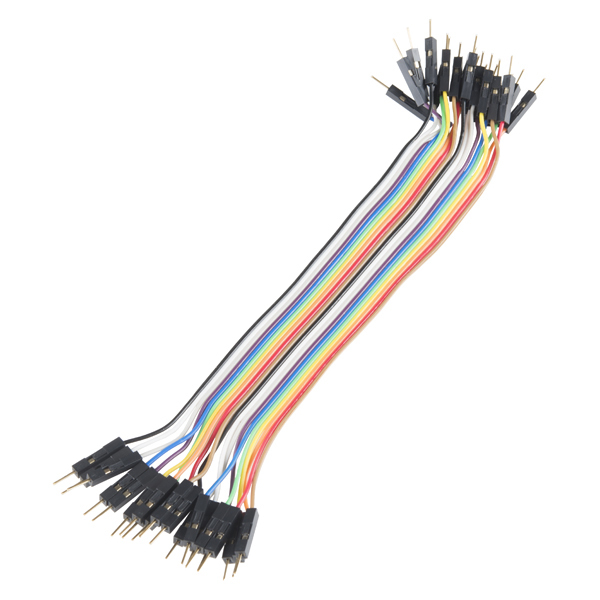 The sensor comes with three wires: red (power), black (ground) and yellow (PVM, Hall effect pulse output). The wiring depends on the algorithm which you selected for counting sensor’s pulses. The sketch generates the measure of water flow which passes through the sensor by digitally reading the rotatory motion of the wheel inside the sensor. The result is in liters per hour. 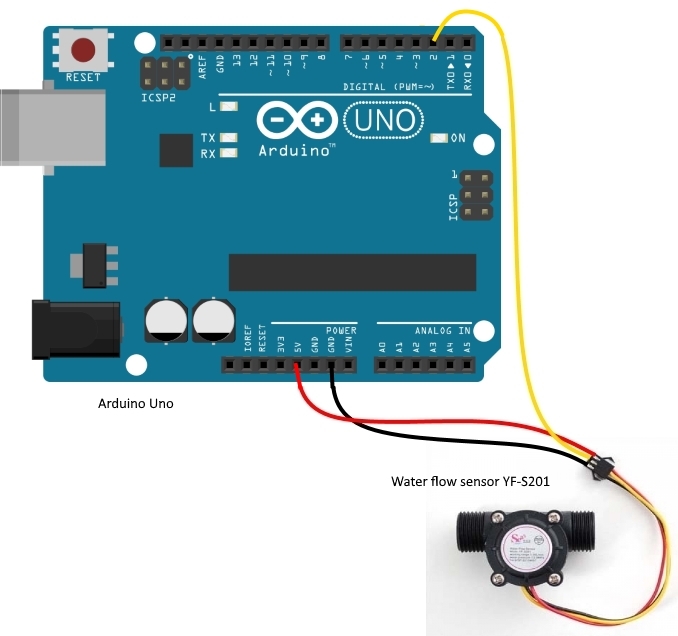 We learnt how to connect Water flow sensor YF-S201 to Arduino board and use it to measure the water flow.